At a hometown wedding or business function, transporting your guests isn’t much of an issue. Things aren’t as easy when you arrange a destination wedding or conference and your guests are out of towners. They need transportation throughout the trip. The most important item of that list is airport transportation. After all, you wouldn’t want your guests to arrive at the airport and have to figure out how to get to where they need to go, would you? Imagine yourself as an out of town guest, arriving in Santa Barbara for a business conference. You’ve had to endure an early check-in, a flight, and gathering up your luggage. 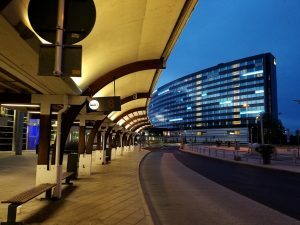 The last thing you want to do is navigate the airport looking for a cab or shuttle to your hotel and hoping you arrive on time for whatever may be planned. That’s exactly how your guests feel. So, why not organize them private airport transportation? It’s the perfect way to provide your guests with either a private car or handy airport shuttle, right from the door of the airport to their accommodation. With private airport transportation, a driver will meet and greet your guests and transport them to their destination safely, reliably, and on-time. Whether your out of town guests are business travelers flying into a nearby airport or your guests for your out of town wedding, you can count on a private chauffeur to arrive on time and offer first-class service. Just imagine how grateful your guests will be for the convenience and reliability after their flight. Book private airport transportation or corporate transportation from Silk Road Transportation today and let your guests travel in the lap of luxury.